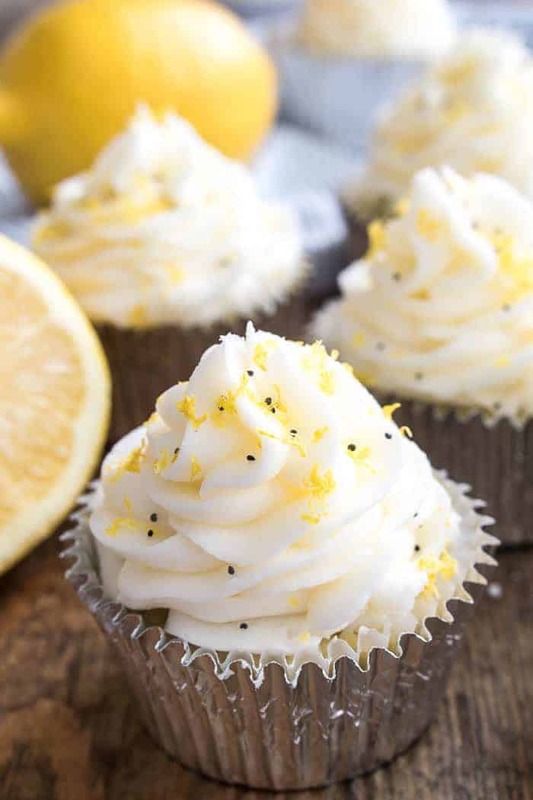 If you love all things LEMON, you’ll go crazy for these Lemon Poppy Seed Cupcakes! 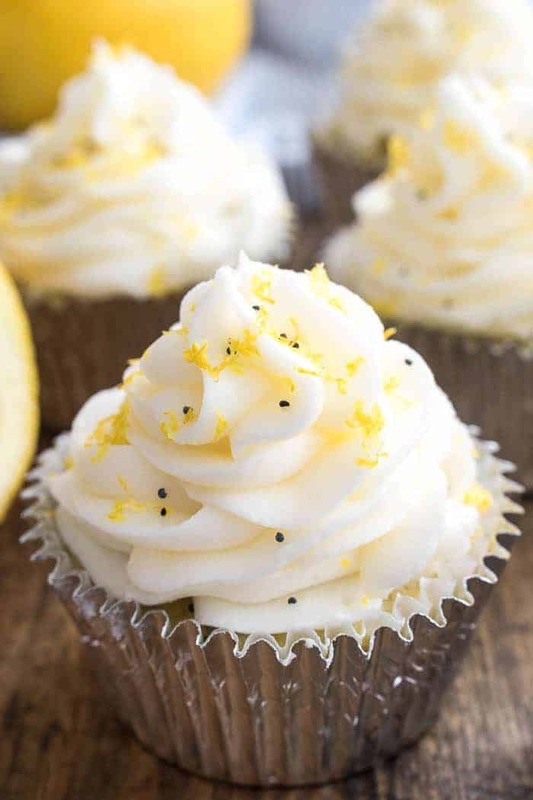 Sweet, dense lemon cupcakes topped with homemade lemon buttercream frosting…these cupcakes are completely bursting with citrus flavor. And since winter is citrus season, it’s the perfect time to make them! They’re the ideal treat for birthday parties, baby showers, or any special occasion, and once you taste their sweet lemon poppy seed goodness, I guarantee you’ll be making them all year round! 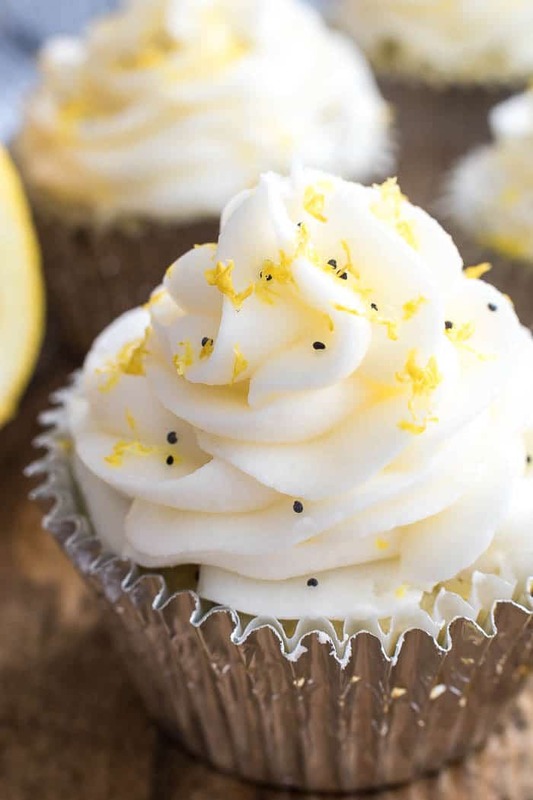 HOW DO YOU MAKE LEMON POPPY SEED CUPCAKES? Measure your ingredients accurately. Most importantly? Be sure you spoon your flour into the measuring cups instead of scooping. This ensures that your cupcakes won’t end up dry. If possible, use fresh lemon juice. As with any fresh ingredients, fresh lemon juice will give you the most authentic (and delicious) lemon flavor! Use a cookie scoop to measure batter. I love using a cookie scoop to guarantee that all my cupcakes turn out the same size. Double the frosting recipe. If you’re anything like me, the frosting is the best part. Don’t be afraid to double it up! So. I have to say. I’m kind of loving this winter so far. It’s been a strange one….that’s for sure. A couple winter thunderstorms, some seriously cold weather, snowstorms followed by 50 degree days…. But for some reason, none of it seems as bad to me this year. Maybe it’s just a matter of getting older? And accepting the fact that this IS Wisconsin, after all? Or maybe it has to do with the fact that I don’t really leave my house that much? And when I do….I don’t really spend any time outside? Or maybe those 50 degree days have been just enough to make it all okay…. Whatever the reason, I’m feeling very content with the fact that it’s late January. Which is something I’m not sure I’ve ever said. But really…before we know it, February will be here, and then March, which is basically spring! Right? And in the mean time, I’m focusing on all the good things winter has to offer. At the top of my list? LEMONS. I’ve been absolutely LOVING lemons! And not just lemons, but all the fresh citrus fruit that’s in the stores this time of year. I recently made Lemon Chicken Piccata (SO good) and have had a steady supply of fresh limes on hand for Irish Mules. But just this week? I’ve had a taste for something sweet. And these Lemon Poppy Seed Cupcakes came to life. Not only are they perfect for citrus season, but they’re especially perfect for occasions that call for an extra special sweet treat. I’m beyond excited today to be part of a virtual baby shower for my friend Lindsay, who blogs over at Life, Love and Sugar, and is expecting TWINS!!! I’ve known Lindsay for a couple years now, and have been waiting for this day since the day I met her. I’ll never forget sitting in a hotel room with her in San Francisco, listening to her talk about her struggles to get pregnant. And I’ll never forget thinking….of all the people I know….what an amazing mother she would someday be. And then….the announcement came. She was pregnant with twin boys! And suddenly, everything was right with the world. Now, I know that ALL baby showers are special, but there’s no denying there’s something particularly special about this baby shower. And when you have a particularly special occasion? Of course you want to bring a particularly special dessert. 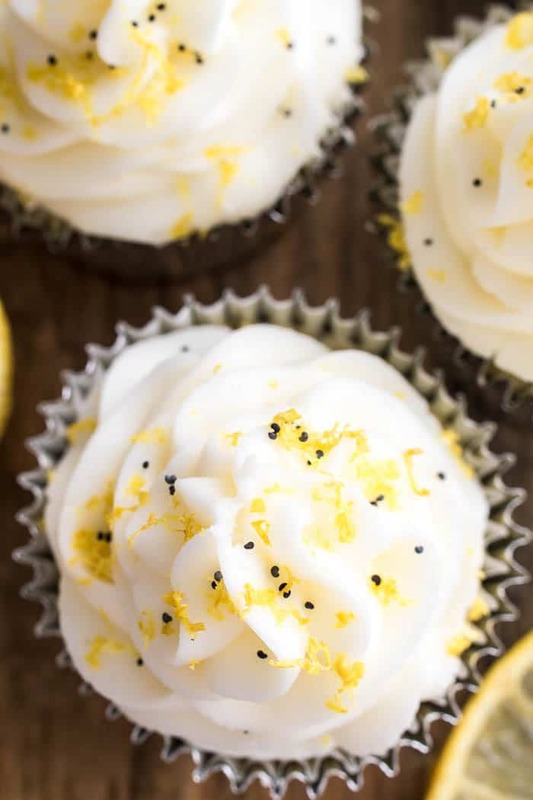 Like these Lemon Poppy Seed Cupcakes! I don’t know about you, but I like my cupcakes a little bit on the dense side, and these cupcakes are exactly that. They’re the perfect balance of sweet and lemony and cakey and chewy. And loaded with lemon flavor. In other words, they’re absolutely perfect. And when you top them with JUST the right amount of lemon buttercream? They’re out of this world delicious. Perfect for winter, and baby showers, and any time you need something to celebrate. 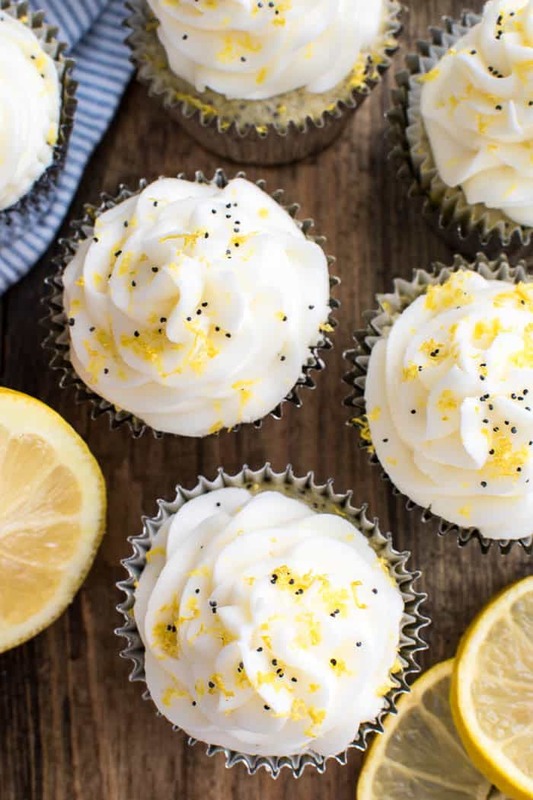 Because these Lemon Poppy Seed Cupcakes are definitely something to celebrate. I hope you enjoy these Lemon Poppy Seed Cupcakes as much as we do! And I hope you’ll stop by to celebrate Lindsay with some of my other best blogging friends! 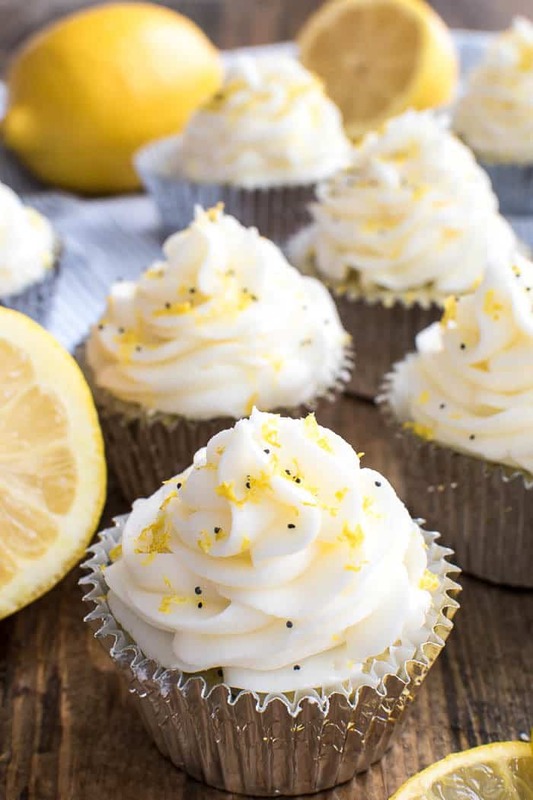 If you love all things LEMON, you'll go crazy for these Lemon Poppy Seed Cupcakes! Sweet, dense lemon cupcakes topped with homemade lemon buttercream frosting...these cupcakes are completely bursting with citrus flavor. Preheat oven to 325°. Line two 12-cup muffin pans. In a separate large bowl, beat butter, granulated sugar, and lemon zest until light and fluffy. For the frosting, beat the butter until light and fluffy. Gradually add 2 cups powdered sugar, beating well. Slowly add in milk and lemon juice, then beat in remaining powdered sugar. Pipe frosting on to cupcakes; top with lemon zest and poppy seeds. What piping tip did you use in these pictures? They look awesome, can’t wait to try! I will not make these cupcakes again. They are just OK. They are kinda bland and texture is not good. I am a new convert to poppyseed and I absolutely love them with lemon. These cupcakes are gorgeous! I’m with you on lemon and winter going hand in hand! I usually crave all things lemon in January too!!! These are so pretty! I love lemon desserts! These cupcakes look amazing – loving all the cupcakes for Lindsay today! LOVE the poppy seed in this! I love all things lemon and poppy seed so I know I’d love these. I am also a huge fan of lemon! I have always loved lemon poppy seed bread. Why have I never thought of a cupcake that I can add icing too! Oh my! These look awesome! I couldn’t agree more about spooning the flour in to measeure…definitely a game changer! This flavor combination is perfect especially for a baby shower! I’ll make sure to eat at least two in honor of the twins. I’ve always loved the lemon-poppy seed combo for cakes and cupcakes. I’ll bet that sprinkling of lemon zest on top makes these really “pop” with deliciousness! This looks like a little ray of sunshine! Perfect flavor combination!! So what do I do with the other half of the dry ingredients. Doesn’t say what to do with the other half unless I missed a step? I am making these for the first time and I have that exact same question!